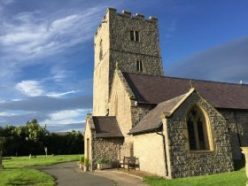 In 2017 there began a building project to provide a toilet and kitchen, to open the chancel by relocation of the low wooden screen, to improve the heating, and to redecorate. St Michael’s Church has served its community and been served by it for over 1000 years. It has seen a lot of adaptations in that time, but has never been transformed or rebuilt. That means that you can see evidence of its many phases of growth in the building. Hopefully, the latest adaptations will equip the church to fulfil its mission in the 21st Century, and ,as before, to draw on the support of a faithful community. 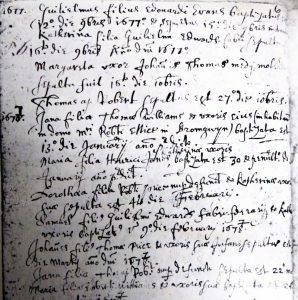 We hold bound copies of the Parish registers from 1673. These record church baptisms, marriages and funerals. The originals are held at the Denbighshire County Records Office, Ruthin, 01824 708250. We also hold a copy of a survey of the memorial stones in the churchyard undertaken in 2005 and published in 2009 by the Clwyd Family History Trust. This is a survey of the location and inscriptions of gravestones, including names and dates. It can be used to locate memorial stones, provided that they were visible in 2009, and that they still are. Please ring or e-mail Roland Ward, (see contacts page) to arrange an appointment to view the records in church.